Majestic old River Red Gum trees (Eucalyptus camaldulensis) along the Moralana Scenic Drive near Merna Mora Station in the Flinders Ranges National Park, South Australia. Moralana Scenic Drive runs through Arkaba Station and Merna Mora Station south of Wilpena Pound takes you some of the best scenery in the Flinders Ranges. Merna Mora Station still operates as a working station property but Arkaba is now a tourist resort and private wildlife reserve. Moralana creek and its feeder streams are also lined with some of the most impressive river red gums in the Flinders Ranges, their massive, gnarled trunks and branches bearing all the signs of a tough few centuries of survival. This image belongs to the travel and nature stock photo library. This stock photo of Old River Gum (Eucalyptus camaldulensis) is available for licensing for commercial and editorial uses including websites, blogs, books, magazines, brochures and advertising. Restrictions may apply for images which contain third party copyrighted material or sensitive subjects. Photos of artwork are for editorial use only. 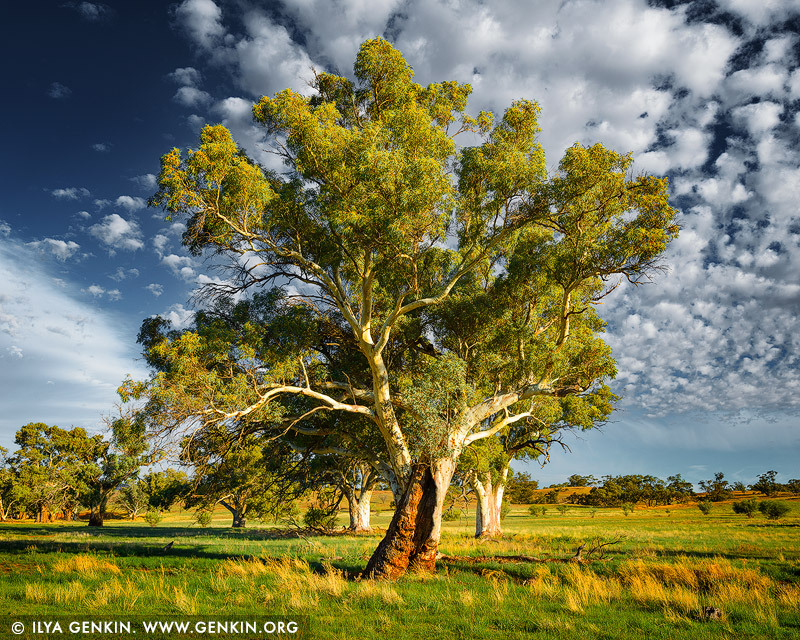 This image id AU-SA-FLINDERS-0018 of Old River Gum (Eucalyptus camaldulensis), is copyrighted © by Ilya Genkin. This is not a public domain image.